The Trimble BD960 GNSS system is a multi-channel, multi-frequency, OEM GNSS receiver, in a Eurocard form factor measuring 100 x 106.7 x 12.7 millimeters. The centimeter-level positioning technology is designed to ease product and system development by original equipment manufacturers. It includes 72 channels for GPS L1, L2C, and L5 code and carrier signal tracking and four additional channels for satellite-based WAAS/EGNOS/MSAS support and three levels of OmniSTAR L-band services. 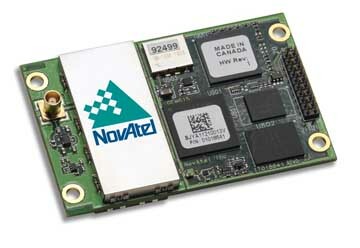 Ethernet connectivity available on the board allows high-speed data transfer and configuration via standard web browsers (Internet Explorer 7.0 or later and Firefox 2.0 or later). A starter kit includes the BD960 receiver, I/O board, power supply, configuration software, and reference manual. Pacific Crest Corporation, Santa Clara, California.